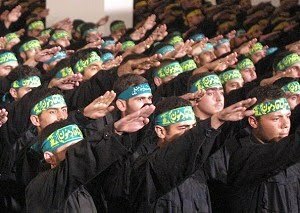 According to a report by Washington Post that Barak Hussein Obama’s administration is considering to reach out to Hezbollah just like the British reached out to Sinn Fein in Mid 90’s. It seems that Barak Hussein Obama wants to keep his nobel peace prize at all cost even at the cost of our nation’s national security. It is a huge mistake to think that Hezbollah, Ahmadinejad, and other jihadist would be interested in dialogue and negotiations. The west have nothing to offer them, they are determined to bring their Islamic messiah by waging war on the infidels even with weapons of mass distraction. Hezbollah’s secretary general Hassn Nasrallah outlined in his own words the plans and intentions of this jihadist organization. Yet, American administration thinks that they can reason with these jihadists. Since Obama took office he has succeeded to promote Islam, encourage the Shi’ite and Sunni jihadists to rise to prominence, appoint Muslim brotherhood individuals to sensitive and key positions within the U.S. governments, work against our allies in the Middle Eastern region, and weakened our national defenses. It would be a huge disaster for the American people to allow Obama to be a second term president. Some may might ask, why would Obama kissing the hands of these jihadists? This is a very good question that many have tried to answer without being called all kinds of names. One must look at Obama’s words and deeds to come to the conclusion that he is not for the American way of life, he thinks it is unfair to live differently than the rest of the world. He is also been working to make this nation a socialist/communist nation. Obama allowed Hezbollah to take over Lebanon and now he wants to reach out. Wake Up America and vote for America.